Blenheim Palace is an 18th century aristocratic residence. It is the ancestral home of the Dukes of Marlborough. The first Duke was given this former royal property by Queen Anne, after his victory over the French at Blenheim (Blindheim) in 1704. This triumph is also memorized on site in a number of military trophies and ten large tapestries. The palace was built between 1705 and 1722 by the architect John Vanbrugh. Its architectural style is eclectic, with baroque, (neo)gothic and neoclassical elements. The grounds include formal gardens plus a landscape park designed by Capability Brown. They cover an area of 3 hectares in Woodstock, Oxfordshire. 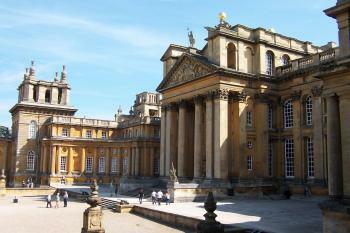 Blenheim Palace also is the accidental birthplace of Sir Winston Churchill (1874). 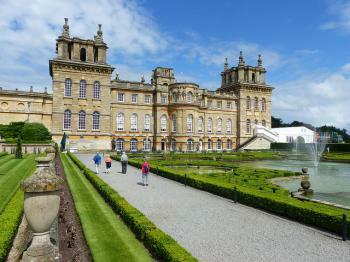 I visited Blenheim on a half day trip from Oxford. Bus S3 gets you there in about half an hour. It was pouring when we left Oxford bus station – not a good thing as I had planned to have a walk around the park first. The palace itself does not open until 10.30 a.m., so I had about an hour beforehand. From the main entrance it’s quite a walk to the palace and the surrounding park and gardens. This definitely is a landscape park, with artificial(?) hills and wide open spaces. And lots of asphalt too. Superficially there are lots of similarities with a WHS that I visited about a year ago – Muskauer Park. Despite the rain I wasn’t the only one around. Local joggers use the hilly terrain as training grounds. After an hour my feet started to hurt and I was happy that I could go inside and out of the wet weather. Entrance to the site costs a rather steep 18 pounds. As the palace has no other external funding, this probably all goes into the restoration and conservation of the complex. Tours of about half an hour are conducted through the State Rooms. There are also tours of the private apartments when the current Duke of Marlborough is not at home. This Saturday morning the tours ran almost continually to accommodate the stream of visitors. These palace tours aren’t really my favourite pastime, but the guides weren't too slow or boring and I found a couple of interesting things on show. Amidst the innumerable family portraits of all Dukes and family members, there’s a good collection of Chinese porcelain (Fu-kien blanc du Chine). And of course the famous Flemish tapestries depicting the battle of Blenheim. Furthermore, the impressive Saloon which is fully covered in murals by Louis Laguerre. Outside again, I had a look at the Water terraces and Italian gardens. Although it had stopped raining, the weather wasn’t bright enough to really enjoy walking there. 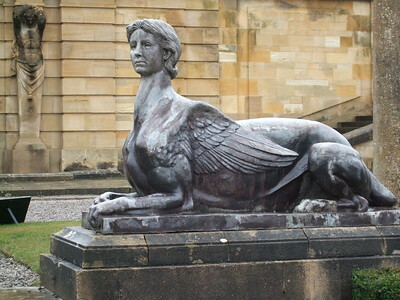 What I did like were the numerous sculptures in the gardens which includes a formidable sphinx. After about 3 hours on the grounds, I had enough and caught a bus back to Oxford. In all, it was quite a good visit for a palace or stately home (not my favourite kind of WHS). March 2018 still Roadtrip England. We were heading back from the north in the direction of London. Shortly before arriving at Oxford we came here to Blenheim palace. Unfortunately it is not included in the national Trust community. We had to pay something like 30 Pounds only to enter the gardens.But the gardens are really nice and the castle is also worth visiting from outside. Close by is a butterfly house and a maze. Both are included and are worth visiting, too. My wife and I visited in early June 2017. This was a surprising site for me, as I didn't have particularly high expectations but Blenheim Palace far exceeded them. It was originally built by the first Duke of Marlborough to celebrate his victory over the Austrians in the Spanish War of Secession (in Blenheim, southern Germany). It's still their ancestral home and Sir Winston Churchill was born here. The exterior is very grand and impressive, and the interior is quite good too. Lots of variety in the rooms, from the austere front rooms to the lush formal living areas at the back. It's still used as a home occasionally, so large parts of it are still off-limits - don't expect to access every part of it! There's a large exhibition about Churchill on the ground floor too, though I skimmed through this as I'd visited the War Rooms in London a couple of weeks prior and it was retreading similar areas. The palace grounds are enormous and beautiful too. Lakes, cascading water, fountains, a butterfly garden, hedge maze for kids to play in, and the list goes on. Good separation between formal and informal gardens too. Blenheim Palace is a fine example of British architecture and landscaping, and as the ancestral home of the Dukes of Marlborough, is rich in Churchill family history. The Crown bestowed funds to construct a palace to John Churchill, the first Duke of Marlborough, following his military success at the eponymous Battle of Blenheim, during the War of Spanish Succession in 1704. Although the choice of Sir John Vanbrugh as architect, rather than Sir Christopher Wren, was controversial, I rather enjoyed the grand Baroque style of the palace when I visited in the spring of 2009. The state rooms are rich and filled with information about the Churchill family, including Sir Winston Churchill, who was born, but never lived, at the palace. Photography is allowed inside, although commercial photography requires prior permission. In answer to a question I'm sure the ancient Dukes of Marlborough never had to answer when guests visited, wifi is also available in public areas. Outside the palace are grounds that were improved by the famed landscape designer Capability Brown. I enjoyed walking around the lawns and gardens, and particularly appreciated the cascades and the Marlborough Maze. 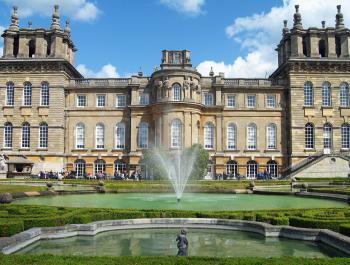 Blenheim Palace is a great place to spend a day out from London or Oxford. Logistics: Blenheim Palace is just northwest of Oxford, and can be reached by private or public transportation, including buses from Oxford or coaches from London. The palace currently offers discounts to visitors who arrive via public transportation. Photography isn’t allowed inside so allow me to paint you a picture. It won’t be as detailed or valuable as the painted pictures will cover the walls of the rooms along the back of the palace – they show in vivid colours the battles of the first owner, John Churchill, victorious every time. This painting of mine also won’t capture the scale of the official dining room, an enormous room the size of a small theatre with pictures drawn on the walls and enormous silver decorations on the table. Room after room connect to each other with a thousand stories in each. Over the generations the owners have left their mark. Most of the palace was either restored or redecorated by the 9th Duke of Marlborough who used the 60 million dollars (in today’s terms) he was given for marrying American heiress Consuelo Vanderbilt, whose family thought the English title for their daughter was worth the money, despite the absence of true love. I visited this WHS in June 2016. I visited the palace and vast gardens in the afternoon just before the Nocturne festival took place (starring Elton John). As it was raining when I arrived I decided to buy the very expensive ticket to visit the palace interior and the gardens. The palace interior though is more like a wealthy mansion's interior and does not compare to other palaces on the WH list. The main focus is Winston Churchill and unless you're a movie set fan or keen to learn more on Churchill you wouldn't be missing much if you skipped the palace interior. The highlight for me was the recently restored North Portico just above the main entrance and you don't need to pay extra to see that. I also loved the old palace key displayed near the entrance. Luckily the sun came out while I was visiting the palace so I gladly went outdoors to explore the water gardens (picture), the private Italian garden, the lakeside trail and the far away pleasure gardens. If you park your car at the car park closest to the pleasure gardens trail and you want to have a look at the gift shop, head to the gift shop first. That way you'll be able to visit the pleasure gardens and then head towards the car park without having to go all the way back to the palace. Make sure to allow at least a full day to visit the lovely old colleges, churches and university town of Oxford even though it isn't a WHS (yet). 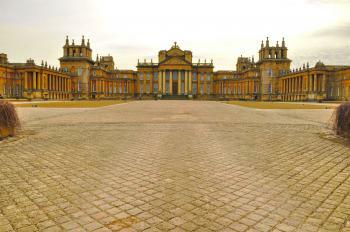 I visited Blenheim Palace in October 2013. This was the day the clocks went back, marking the arrival of the cold and depressingly short days of winter. It was also the day of “St Jude’s Storm”, though the symptoms were hard to discern at Blenheim. John Churchill, 1st Duke of Marlborough, was given the palace and his title as a reward for his decisive victory over the Franco-Prussian army in 1704. The English force had not been expected to win, so when they defeated King Louis XIV’s army – sending the message to the French monarch that he could no longer roam around Europe with impunity – Queen Anne and a grateful nation felt they needed to reward Churchill. The name Blenheim is an anglicised version of the site of the battle, Blindheim, in Bavaria. I was particularly interested in this being the birthplace of Winston Churchill, and his letter to his parents are displayed in one of the rooms. It was amusing to see letters with dates like "14.11.94" and to have to remind oneself that the year being abbreviated is not 1994, but 1894. Nearby you can see Churchill’s grave at the parish church at Bladon. We didn’t go there this time, but it is somewhere I would like to visit one day. 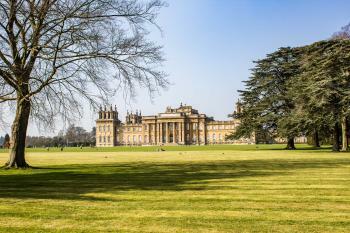 Located in the pretty town of Woodstock, Blenheim Palace makes a great excursion from nearby Oxford (which by the way is a fantastic city with many outstanding museums and colleges). What strikes a visitor immediately is its massive size, much bigger than many more famous palaces and probably only rivalled in size by Versailles. The interior is also quite impressive, but no so outstanding. 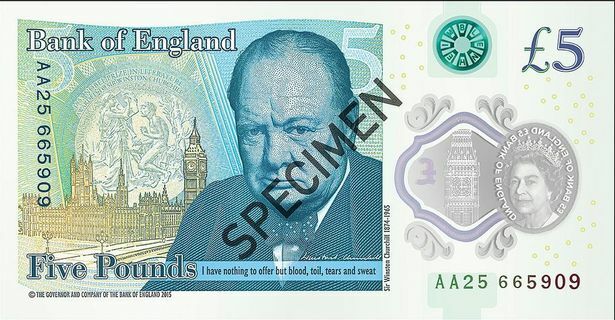 They make a lot of their connection to Churchill (with an interesting exposition), but of course the major attraction is the 18th-century architecture and design. Even though I liked the palace more than I would have thought, I found the huge gardens even more impressive. They were designed by Capability Brown and include a large artificial lake (with a waterfall), a rose garden, and many other features. Seeing the palace and the garden takes at least half a day, especially on a nice summer day (which means huge crowds as well), but is certainly worth your time (even though the entrance fee is quite steep). There are good bus connections from Oxford. 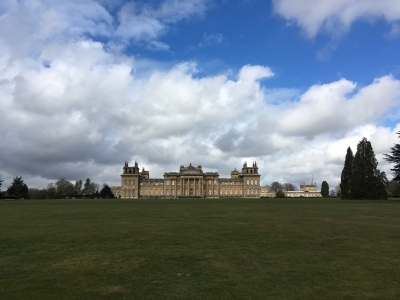 The UNESCO World Heritage Site of Blenheim Palace is such a lovely place to visit and enjoy in the town of Woodstock near the famed university town of Oxford and also one of nicest places to have high tea outside London. When the bus driver dropped me out at the palace entrance bus stop, I was quite surprised to find that the palace car park was already almost full with cars of visitors even in winter. After paying a hefty 21 GBP to see palace and gardens, I was at the palace gigantic main gate with beautiful golden family seal and large letters “M” for Dukedom of Marlborough, an owner of the palace. I was surprised with the strange layout of the palace that the main gate did not provide a grand view of the whole complex which was typical of palace design, and actually from the entrance I could not see the palace at all as it was hind behind a forest grove, a clever design. The direction was also confusing that I had to walk pass the souvenir shop from the side entrance so that I could enter the inner palace ground; however after the second ceremonial gate, the whole palace surprisingly appeared from the left in front of me. At first I was quite disappointed with the size of the palace as I heard that Blenheim was the biggest aristocrat house in England, so I expected the super larger than life building similar with royal residence; however after looking the place for a while I stared to appreciate its size and the beauty of design. Apart from the nice interior, the most interesting part of the palace building and often overlooked, in my opinion, was the ceiling of the main entrance portico which was the painting of six curious eyes. The garden of the palace was also lovely, its water garden was one of the best, and I was very delighted that even in winter the garden and its fountains were still look nice and full functioned. The Water Terrace Café was also the lovely place for High Tea in the afternoon; the atmosphere and view were truly a good experience. The large landscape around the palace by Capability Brown was also great, the lake, cascade, beautiful grand bridge and large lawn were designed to enhance the look of the palace. Another highlight of the palace but I did not have time to try was the miniature train, so I only watched it from the distance. Palace's staffs were also very attentive and polite, sometime I felt they were butlers of the Duke and not just normal staffs! I spent a lovely almost four hours in the palace before returned to Oxford and London, a nice enjoyable day for a glimpse of elite world. We (my husband and I) visited Blenheim together with my son's family in April, and again in June with my sister-in-law and my husband. on the first visit we converted our entry fee to a year's Pass, which proved useful on our second visit. We enjoyed both times very much,exploring both the palace and its marvellous grounds. Some of us will surely come again! One of the high points of my visit to The UK was the trip to Blenheim Palace.It was grand to say the least of it.I was impressed by the architecture.gardans and lake I remember the place where Sir Winston proposed to Clemmie!A most memorable visit. I visited Blenheim last year with my wife and thoroughly enjoyed the day out. The building and the contents made the whole experience one of the best palaces I've seen. The grounds and gardens are fantastic. This linked the fabulous history of the Churchill family make this an experince not to miss. Blenheim Palace is the quintessential English stately home, with vast landscaped grounds and a central building dripping with extravagance. I must admit palaces bore me rigid as they remind me of school trips when I was younger, but this was a pleasant experience and the amount of art and antiques on display was impressive. There was also a strong link between the elites of France and Germany which was nice to see a more Europe wide history on display. The entrance fee was a little steep £10 (€14) and you are not allowed to take photos inside the Palace, but you do have the chance to have a guided tour which is very informative if a touch pompous, in a way that only the English can be! They make a lot of the connections to Winston Churchill, but it turns out he was only born here and never lived here. The grounds are very large, they were designed by Capability Brown who was the most sought after landscape designer at the time, and the waterfalls are extremely nice. There is also a little pleasure garden replete with a maze, putting green, model village and miniature train (English to the very core!). Blenheim is just outside of Oxford which is a fantastic city to visit for its University and associated buildings, (busses run to the Palace from the central bus station), The surrounding area of the Cotswolds is what most people think of when they dream of England! This is perhaps the best sight to visit if you want to get the quintessential English experience. 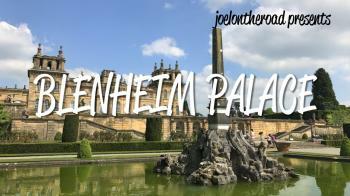 Hi my name is Emilee-Elizabeth and I took my family to the Blenheim Palace and we all loved it. It had great facilities it as really well maintained and the transport and entry prices were reasonable. My husband Dylan thought it was great, p.s he loved the food! Mausolea: The Chapel contains the Mausoleum of John Churchill, First Duke of Marlborough (the body was transferred there from Westminster abbey where it had originally been buried). Subsequent Dukes through to the 11th Earl who died in 1972 are buried there. Triumphal Arches: There are 2. At the entrance Gate to the Park and at the East Gate of the palace. British Military victories over France: Named after the Duke of Marlborough's victory on 13 Aug 1704 over Louis XIV's Franco-Bavarian army at Blindheim (S Germany) during the War of the Spanish Succession. Marlbrough commanded troops of the Grand Allaince including 16000 British plus Prussian, Austrian, Danish, Dutch etc with a total of over 40000. The palace, whose construction commenced in 1705, was given to Marlborough in gratitude by the British nation. Queens and Empresses: The palace was built by the decision of Queen Anne who want to honour Duke of Marlborough with a great palace. 253 Community Members have visited.